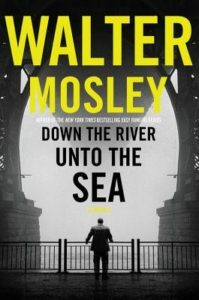 Water Mosley is another one of Bob Moyer’s favorite authors (I like him a lot, too), and here Bob takes a look at one of Mosley’s interesting and crusading detectives. DOWN THE RIVER UNTO THE SEA. By Walter Mosley. Mulholland Books. 322 pages. $27. Joe King Oliver is one of those men. Ten years ago, Joe was framed, jailed and bounced from the NYPD. A private detective now, he gets a letter from the woman who framed him, saying she’s willing to help him clear his name. At the same time, another woman approaches him to help save A Free Man, a journalist who she says was framed in the killing of two crooked cops. He takes on both cases. The investigative path Mosley puts him on is not a primrose one, planted with convenient clues. No, Mosley sends Oliver into the streets “…filled with madmen and redbirds, nameless cops and women who fooled you again and again.” Out there, Joe thinks, “America was changing at a snail’s pace in a high wind but until that gastropod mollusk reached its destination,” he has a .45 in his pocket and “…eyes on all four corners at once.” He can’t avoid trouble, however, since he goes looking for it. After a couple of close calls that could have been his demise, Joe does what Mosley makes clear millions of black men do every day—he dons a disguise to survive. These are mean streets Raymond Chandler never imagined. Joe’s search leads him through a gallery of characters as colorful as Mosley has ever created. There’s the woman the journalist saved from the massage parlor whose “…figure … had betrayed her again and again from the age of thirteen.” Joe talks to a boy named Burn, used by the crooked cops in so many ways, “so high he could see into heaven.” And Mel, the psychopathic clock repairman who says he owes his life to Joe, will do anything for him — and does. With his help, Joe makes it through, and delivers justice everywhere you look — but in the courts and newspapers. Joe King Oliver is good enough to stand on his own, or join the ranks of Easy Rawlins and Leonid McGill in a series. He’s one for the books. This entry was posted in Detective fiction, Mysteries and tagged detective ficition, Joe King Oliver, Mystery, Walter Mosley. Bookmark the permalink.